Forming continents, islands, mountains, valleys and rivers works with mashed potatoes, beach sand, mud in the back yard and pixels in the virtual world. 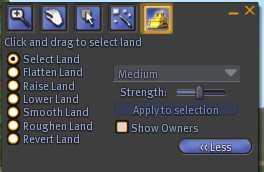 Terraforming physical landform characteristics including mountains, valleys, rivers, oceans, lakes and beaches is as easy as a click with a mouse on the correct tool and then sliding or moving the mouse in a circular motion to raise, lower, flatten, roughen and smooth the land. The size of the area as well as the strength of the tool is adjusted as desired. A little practice in an empty “sandbox” is typically enough to get the “feel” for pressure and size attributes. Adding Flora and fauna to the newly formed topography is an opportunity to learn about climate, elevations and ecosystems. Geography standards include various elements of map reading. 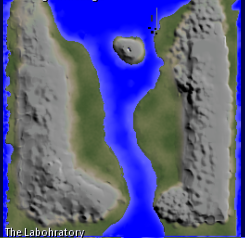 Reading the maps in a virtual world and being able to zoom in provides not only the opportunity for recognizing the use of a legend, direction, location and distance, but also the ability to see influences of hydrology and physical characteristics of a place. The virtual environment offers students alternative ways of learning concepts. Educators understand that differentiating instruction is important and that we should not limit ourselves to telling and explaining. The information in a lecture or demonstration is magnified when students are given an opportunity to actively engage in an activity that provides a way for students to practice, apply or even play with the new content. A community college professor demonstrates a virtual world activity designed to follow a lecture and provide students a chance to “build a molecule” in virtual space. Remember the clubhouse in the woods you built with your friends. It was your clubhouse. You and your friends thought of it, planned it, gathered materials, constructed it, fought about it, fought in it, plotted in it, pretended to be super-heros or knights in it, and then probably tore it down because it seemed like a good idea and it was yours to tear down. Remember the playhouse that the little girl down the street had. Her father built it for her. It was a beauty; A door with hinges and a door knob, heart-shaped shutters, flower-boxes, shingles, matching curtains and furnishings. She had a birthday party and everyone got to go into it but you couldn’t “mess it up”. Nobody really played there much, it collected spiderwebs. It sat forever – a monument to adult intervention. As I listened to the ISTE Speaker Series on SL Tuesday night, Knowclue’s message was most profound. She said she is a stickler on students building and making their own environment in SL Teen Grid and now on Reaction Grid where she provides instruction. I sat in the audience and asked “what evidence do you have of student achievement?” My thoughts were focused on what so many educators are thinking about: test scores, numbers, Adequate Yearly Progress, achievement data, standards. Of course these are important quantifiable data points and so is the remarkable build that her students created. 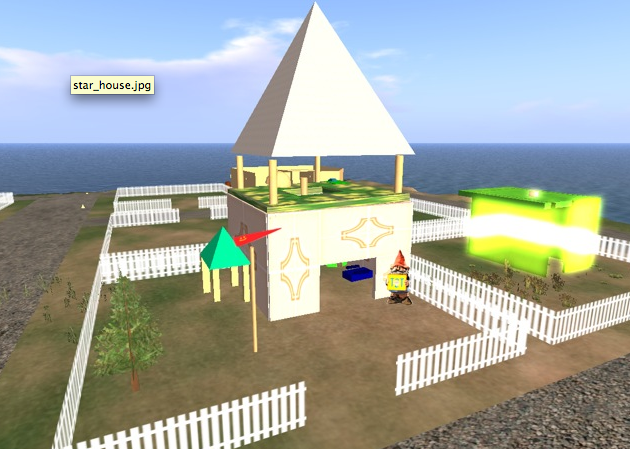 A student build in a virtual world - minimal adult intervention. The evidence is that children built a community based on a unit of study. The student Build required the use of communication, collaboration and problem solving (those 21st Century Skills). It required the use of mathematics and integration of an artistic sensibility. The students had to read/research and take notes, write, and compute. Knowclue has a clue and she also has evidence. The student product is the evidence. The students will be tested in the standards at the end of the year and those scores too will be reviewed – together they form the picture of evidence. My hunch is the students who build will demonstrate more learning gains than the students who have it built for them, look to the evidence.